Yoga Poses to Improve Posture : A posture is the characteristic of one’s way of wearing his body. Maintaining a good posture is very vital because it helps to prevent many ailments in the future. These days, doctors advice parents to make their child sit from an early age to help improve their posture. In this post, we will tell you about importance of good posture, yoga poses to maintain a good posture, types of posture, postures for different jobs. 1. Downward Dog Pose : In order to do this pose, lie on your stomach on the floor or yoga mat. Slowly lift your body on all four’s and bring your hands and feet close to each other to get the Mountain-like structure. Hold the pose for a while. -It helps increase bone density and relieves tiredness. This pose stretches the body and helps get rid of stiffness and pain. It also increases blood circulation. 2. Hand-under-foot Pose : To do this, you first need to exhale and take a deep breath in. Then slowly bend your body forward and put your hands under your respective foot. Your nose should touch the knees (or at least try to touch it) and hold the pose for a while. You may not attain the perfect pose on the first go but don’t give up and bend your body as much as you can. This pose puts immense pressure on your belly fat and helps in reducing it. -This pose helps in digestion. This pose is very essential to get beautiful hair too. Apart from these, it helps relieve stress, exhaustion and improve digestion. Must read : What is Hatha Yoga? 3. Child Pose : In order to do this pose, sit on the floor or mat in Vajrasan(i.e. fold your legs and sit in such a way that your ankle touches your buttocks). Slowly bend forward and touch the floor with your palms. Try touching the ground with your nose to attain perfection in this pose. -This particular pose helps in stretching the back which is very vital for stretching the spine. It relieves any sort of back pain or fatigue in the body. It also promotes a steady breathing in the body and calms the mind. 4. 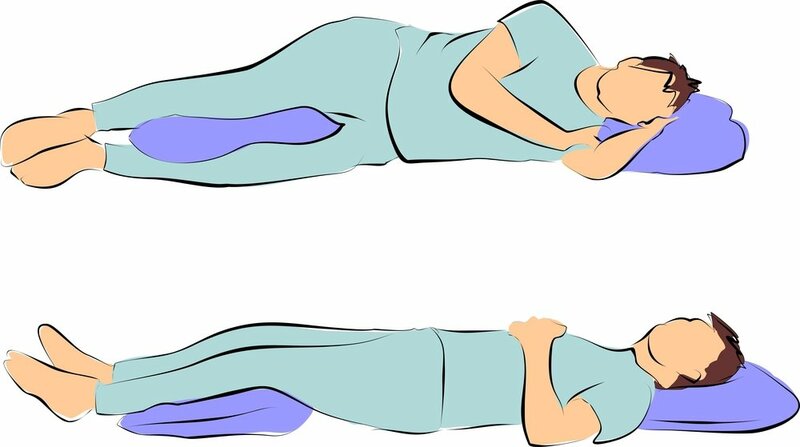 Cobra Pose : Lie on the floor on your stomach. Place your hands beside your shoulder. Push yourself up and look towards the sky as shown in the figure. You can feel the stretch in your stomach region. When your torso gets stretched then the blood flow increases. -Improves flexibility of back, tones abdomens, tones up neck and shoulders, improves blood circulation and rids fatigue and stress. 5. Superman Pose : In order to do this, lie on your stomach on the floor. Stretch both your hands and legs. Raise them slowly. Try lifting the hands and legs at the same height from the ground. Try and hold the pose for half a minute or so. This is a very difficult pose and might take some time to master. -There are various other benefits of this pose. It helps alleviate thyroid symptoms and increase vitality. It also helps massage the spine and keep the back supple, tones the abdomen and lower back and helps you stay in the present. Also it helps to tone the muscles in the arms and legs. 6. Mountain Pose : Stand on the ground. Keep both your feet joined. Spread both your arms sideways. Slowly join both your hands as shown in the picture below. – There are various other benefits of the pose as well. It reduces the symptoms of flat feet, strengthens the lower part of your body, improve concentration and increase alertness. It’s a very good yoga to tone and strengthen your lower body muscles. 7. 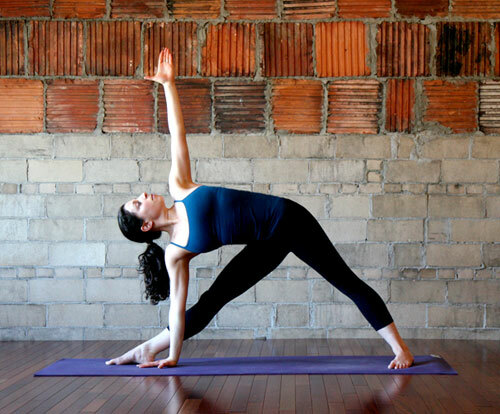 Triangle Pose : Also known as the Trikona Asana. To do this, stand on the ground by stretching your legs on both sides such that they form an inverted spread out ‘V’. Touch your left foot with your right hand while keeping the other hand straight and pointing towards the sky. Hold the pose while you look up and feel the stretch in the body. Do it with the other leg as well. -This pose enable your full body stretch and some organs also get activated. It promotes body balance and helps relieve back pain. It is also a wonderful medicine for stress, anxiety, infertility and various our body problems. 1. 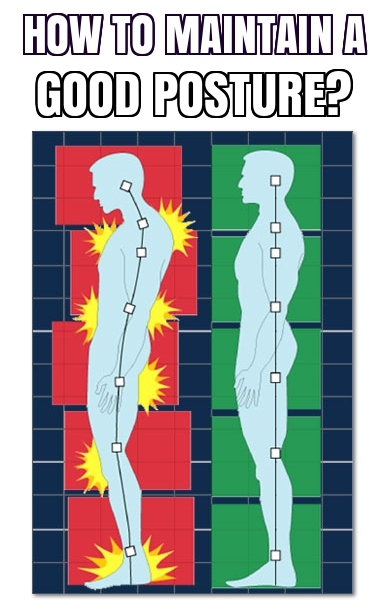 Good posture : Good posture is all about keeping your spine erect. But that does not mean you strain your back. In order to attain a good posture, keep your spine erect and relax. Another wonderful thing that can be done along with keeping the spine erect is holding your belly in. This is what my doctor suggested me. He said “Keep your spine erect and hold in your belly.” So if by any chance you have a belly, then it won’t sag and make things worse. 2. 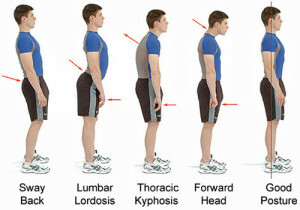 Bad posture : Bad postures are any postures that causes you discomfort. People who have a lot of sedentary work tend to have it. Or sometimes it can be due to lengthening or tightening of certain body muscles. Above are some pictures of bad postures. 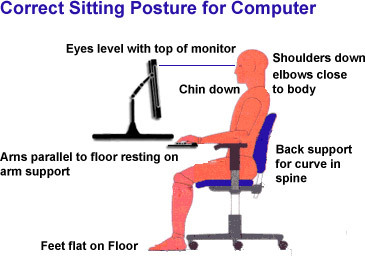 The best posture to sit in front of the computer is slightly more than 90 degree. You shouldn’t lean forward nor sit at 90 degree. It’s also suggested to keep a distance of minimum 30cm from the computer screen. In that regard, if you take the help of your chair back support, then you can attain that particular pose which is best to sit in front of the computer. 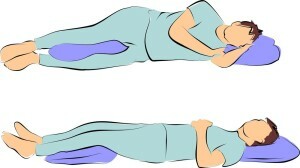 The two best postures to sleep are shown in the pictures above. Doctors say the best type of sleep posture would be when the level of your feet is higher than your head. So it’s advised that you use a very thin pillow or best, none at all for your head when you sleep. You may however place a nice fluffy one below your calf muscles. The figure above shows the best pose to attain when you are seated on a chair. It’s also a very good pose to sit in general. Keep you feet flat on the ground. Hands on the chair handle. And support your spine against the chair back. If you have a job that requires you to sit for a long time, it’s a must to have a chair with a back support. Avoid sitting for too long on stools or benches. We have told you a lot about postures, both good and bad. We have also told you about the yoga poses you should do to keep your posture correct. Here are a couple of reasons that will motivate you to maintain a good body posture. When you maintain a good posture, you take away a lot of stress from your spine. When you put a lot of stress for a prolonged period of time on your spine, you may experience constriction of blood vessels and nerves. When your body posture is properly maintained, fatigue can be lessened. So you can work more efficiently because of less strain on body muscles. When you sit upright, you can breathe more efficiently. This uplifts your state of mind and gives a lot of mental boost. Abnormal sitting poses can lead to excessive wear and tear of joints which might lead to joint pains or arthritis. Sitting upright will also help you to hod your belly and prevent it from sagging. Maintaining a good posture also does away with muscular and back pains. When sitting in an abnormal way, the organs get pressurized and they can’t perform well. A good posture ensures that the body organs work properly. Bad postures can also lead to improper digestion, constipation and even hernia in some cases. That would be all from us on yoga poses to improve posture. If you think we have missed out anything, let us know in the comment box below. Will all these exercises help with already developed hunch back? All my muscles in thoracic spine have been bundled up which makes me feel very sluggish and bad so will these help in opening and straightening them? Cobra pic is actually upward dog. Fyi.